To celebrate the first ever English translation of his most powerful novel The Siege and to talk about his other great works including The Palace of Dreams, The Successor, Agamemnon's Daughter and Broken April. 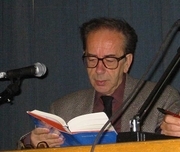 In the fall of 1990 Ismail Kadare left Albania in a gesture of protest against the actions and policies of the Albanian government and was granted asylum in France. Ismail Kadare is currently considered a "single author." If one or more works are by a distinct, homonymous authors, go ahead and split the author. Ismail Kadare is composed of 24 names. You can examine and separate out names.